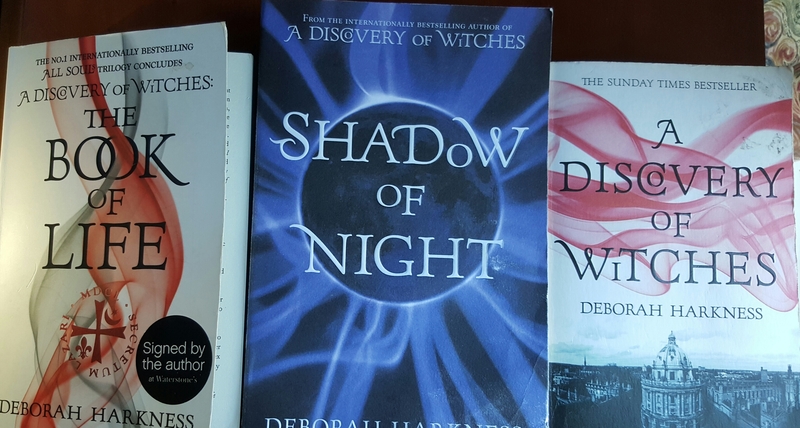 The first book in the series and we meet Diana who is at Oxford University and ignoring the fact that she is a witch. Her life changes when she requests an enchanted manuscript from the library that a lot of people want. We are then thrown into the world of daemons, vampires and witches who all live among us humans. Diana also meets Matthew who is a vampire. And from that point their lives become entangled in a story that unfolds in love, trying to obtain this manuscript, murder and a crossing of boundaries between vampires and witches. Time-travelling is thrown into the mix as Diana and Matthew have to find 3 pages of this manuscript. We are transported back to Elizabethan England and Prague. A lot happens that I don’t want to give away but Diana learns how to use her magic properly, and we learn more about the characters and how they are all connected. Deborah’s historic detail is amazing and really sets the scene and atmosphere for us. It is clever transporting Diana back in time as she acts like we would if we went back. Matthew is different as it is his past and this reminds us that he has lived a long time. The final of the 3 books and so gripping to read. There are so many things that need to be solved, the manuscript needs to be found and understood and Diana and Matthew are also fighting for their family and children against the strict archaic rules of the congregation. So much happens in the books and they are fast paced that we never get bored of the stories. Deborah creates a story that could be set today and is so believable even though there are supernatural elements. We think the story will go in one direction after the first book but more aspects are added to the story as we learn more about the characters and also more threats come by with what Diana and Matthew are trying to achieve. We never know how the story is going to end until near the end and that is good as it isn’t predicable. Also it isn’t a romantic novel as there is a lot of action to keep us going. The characters are fascinating and for me some would be great to know in real life. I liked Diana’s aunt Sarah as she was straight talking and added a slightly comedy element to the story sometimes. I also liked Gallowglass who was like Diana’s protector but seemed a really great person (vampire). All the characters develop through the books but Diana and Matthew developed most as the main characters. I liked them but there was always a slight disconnect for me. Deborah did sometimes write in the first person and from different characters viewpoints which didn’t help and I found distracting to the story. There are also parts of the book where the story lacked and these were mostly to do when they were in the lab talking about test results. Sometimes a bit too much information that was unnecessary. So many different themes are also demonstrated in these books such as old versus new, the question of life and where did we come from, family, love, relationships, control, loyalty, and customs. Overall I really enjoyed these books and despite them being a little slow in places, they were enjoyable reads. If you want something different to read that is historical, creative, imaginative and believable these books need to definitely be on your list.